There are billion of users around the world who love to use his Android Lollipop in daily routine life. There are lot of features off Android Lollipop which help us many time. Today we have to discuss an interesting feature how to increase font size in Android Lollipop. Android phone fulfil over lot of requirement and there are different features which make it special for us. Most of the time we are unable to read the app name properly due to small font on your Android phone. In that situation we need to know how to increase font size in Android Lollipop. If you found small font size in your Android Lollipop then you will be able to easily increase font size in Android Lollipop. There are two ways from which you will be able to increase the font size of any Android phone. Step 1: Tap on the “Settings” option on your Android Lollipop. Step 2: Tap on the “Display & lights” option which is available in “Device” category. Step 3: Scroll down and tap on the “Font size” which is available in “Interface” category. By default your font size is Normal. Step 4: Increase the font size by dragging the slider right side as per your need. Tap on the OK button. Now, the font size of your Android Lollipop will be increased. This is another way to increase or decrease the font size on your Android Lollipop as per your requirement. 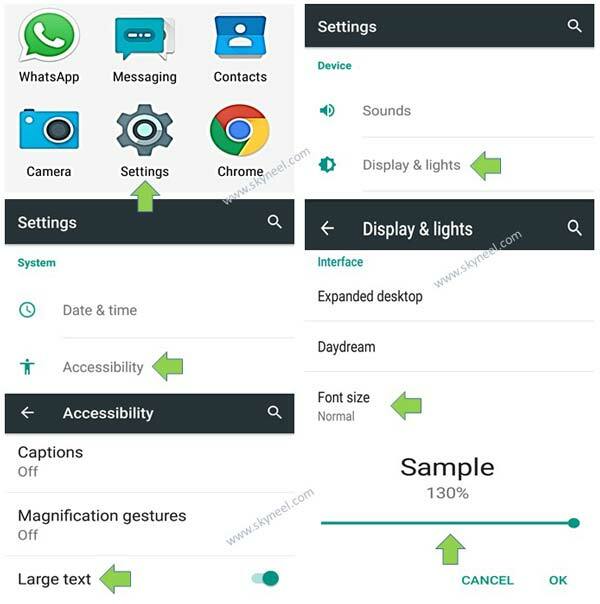 You have to take few simple steps to increase font size in Android Lollipop. Step 2: Tap on the “Accessibility” option which is available on the “System” group. Step 3: Turn on the “Large text” option which is placed in the “System” group. Now, your font size will be increased. I hope after reading this article you will be able to easily increase font size in Android Lollipop. It is the best feature for all those guys who get the difficulty to read the name of any app on your Android phone, due to small font size. Give your important suggestions regarding this article in the comment box. Thanks to all.